Signal Hill is located next to Lions' Head and separates the suburbs of Green Point and Sea Point from the City Bowl. It can be accessed through Military Street, Bo Kaap - watch out for the sign post on Buitengracht Street. Originally named Lion's Rump (together with Lion's Head the hill looks like a lion sphinx), Signal Hill has become a must-do on the list of popular things to do in Cape Town. 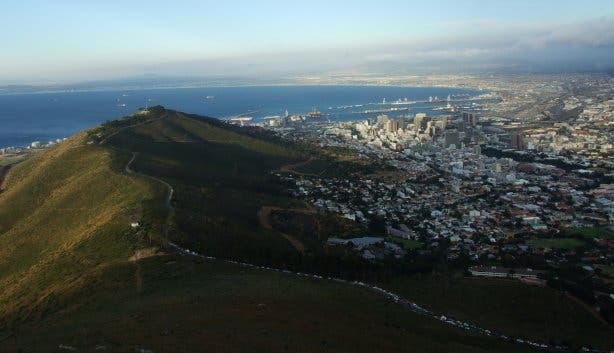 On a sunny day, drive up or walk up this hill for a terrific view over the V&A Waterfront, the harbour, the rest of the city, Table Mountain, Devil's Peak, the ocean and Robben Island. Signal Hill is a popular sundowner venue, with people coming to enjoy the view of the sun setting over the Atlantic. Originally, the Signal Hill guns were utilised to notify the public when a ship was in trouble. Signal flags were used to communicate weather warnings, as well as anchoring instructions to ensure visiting ships were prepared for any stormy weather whilst they were docked in Cape Town's harbour. This very old Capetonian tradition still takes place every day on Signal Hill, just below the mountaintop. At 12h00 exactly, the Noon Gun is fired, an opportunity for people to set their watches. If you're not in Cape Town and would still like to view the Noon Gun for yourself, have a look at this Noon Gun video. For more information on tours and trips, activities, museums, and other Things to Do in Cape Town, subscribe to our free newsletter and browse our Things to Do in Cape Town section. To see Signal Hill in Cape Town on Google Earth, use our Google Earth Signal Hill map.